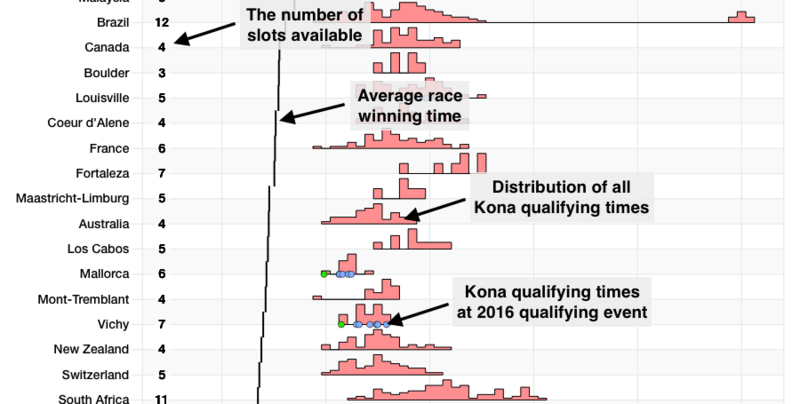 A month back I looked at the numbers behind Kona qualification, focussing on the allocation of slots to races and to age groups within them. Knowing how many slots will be available to your age group is a small part of picking a suitable qualifier, but more important than the number of slots are the finish times required to claim them. How many would-be Kona qualifiers have spent an evening reviewing past results trying to work out the splits they’d need in order to qualify? 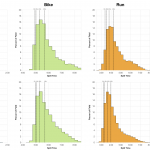 Before you read further: you can find the most recent predictions and statistics for Kona qualification here. Since I posted those estimates of Kona slot allocations for the 2016 season I’ve rewritten some of my analysis tools to pull out previous times and splits and to tabulate that data for each age group. It’s a lot of information. For those who just want a summary I’ve produced two reports covering slot allocations and times for men and women. For those wanting more detail I’ve produced age group reports that detail past results and average splits for every qualifying position. Before I present the data a few notes on the analysis. There is no accounting for roll down here, figures represent the times required to automatically qualify for a slot at a given race. If a race has 6 slots in 2016 then I’ve looked at split times for the top 6 age groupers in all previous races. Some race results have been excluded from averages where course changes heavily skewed times (e.g. where a swim is cut in half). Finally, there are probably mistakes in here; I’ve spent a lot of time reviewing the results and debugging code, but I will have missed something. Qualifying mainly comes down to training, but it’s useful to have some targets in mind. The summary reports below give those targets by highlighting the typical times needed for qualification in each age group and at every qualifying event. Average Age Group Winning Time for 2016 Kona Qualifiers lists the average times (from previous years of racing) for the winners in each age group at a given race. Alongside this is the average overall winner’s time for the appropriate gender. 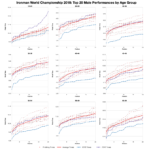 Average Age Group Winning Time as Percentage of Race Winning Time for 2016 Kona Qualifiers lists the above average age group winning times as a percentage of the average overall winner’s time for the appropriate gender. Average Qualifying Time for 2016 Kona Qualifiers lists the average times for all Kona qualifiers in each age group at a given race. Average Qualifying Time as Percentage of Race Winning Time for 2016 Kona Qualifiers as before lists the above average age group Kona qualifying times as a percentage of the average overall winner’s time. Average Final Qualifying Time for 2016 Kona Qualifiers lists the average times for the last Kona qualifier in each age group at a given race. Average Final Qualifying Time as Percentage of Race Winning Time for 2016 Kona Qualifiers again lists the above average age group final Kona qualifying times as percentages of the average overall winner’s time. 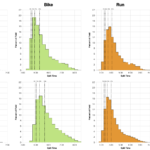 Average Qualifying Range for 2016 Kona Qualifiers lists the difference between the average times for age group winners and the last Kona qualifier at a given race. That’s a lot of dry numbers, but together they give some information on how fast races are, how fast qualifying at those races is and how tight those qualification times are. Averages only reveal so much. The more detailed report below dig deeper including listings of past results and break downs of Kona qualifying splits at every race. The chart at the front of each document attempts to summarise the two sets of tables that follow. As the image above shows there are 4 key pieces of information in each chart. First the number of slots in that age group for a given race. Next the average race winning time (not gender determined this time – my oversight). Then the distribution of Kona qualifying times seen at the race, indicating what times are most common. Finally, if the 2016 qualifier has already been raced, the times for automatic qualifiers at that most recent race. The races are listed in order of average winning time. The Past Qualifying Times section contains tables of past results for each of the 2016 Ironman qualifiers. 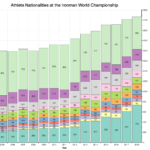 Each table lists the winning time (of the appropriate gender), the age group winning time and, if there was more than 1 slot, the time for the last Kona qualifier that year. Remember that last Kona qualifier times are based on the 2016 slot allocation – if 6 slots are allocated for an age group in 2016 then I will look at 6th place times for all previous races for fair comparison. The tables are summarised with the average times for the three placings. I’m not going to make any judgements about which races offer the best opportunities to qualify. That’s not an easy question to answer and very much comes down to the athlete both in terms of their strengths and their ability to suitably prepare to qualify. I will say that some races are harder to qualify at than others, but the differences between them all are increasingly small. For the most part this data is best used as a sanity check of your goals.